Tracing the plates is pretty easy, provided you did a good job of joining the plates and flattening the mating surfaces of both the garland and the plates. If you place the garland on the flat side of the plates and you see gaps, you need to address that first: assuming you already flattened the garland, you need to flatten the plates. This can be done using a hand plane, and a straight-edge, but if you have a cabinet shop nearby (the place you found that wide sanding belt is perfect) that is a really good place to get the plates dead-flat. Glue some blocks on the two sloped sides of the plates– a strip of 1 x 2 pine furring would be perfect. What you want to do is to produce a flat surface on the sloped side of the plates, parallel to the desired inside surface, so that if you turn them flat-side-up,they rest flat on the strips of wood. Plane the blocks until the flat-side-up orientation (on a level surface) results in a more-or-less level plate surface. Then go talk to the owner of the cabinet shop, and ask if you could pay him to run those two plates through his wide-sander. That machine will produce a dead-flat surface in an incredibly short time. 80-grit or even 60-grit, probably, is fine…the surface does not have to be polished; smooth and flat is perfect. Once you have a flat surface, you can lay the garland on the plate, aligning the center line of the garland with the glue-seam on the plate. Trace around the garland, using a flat washer and a very sharp pencil. The flat washer should be chosen for the dimension of the “flat” portion; you want the width of the side of the washer to be same as the desired width of your overhand– the distance the top and bottom plates will extend beyond the ribs. I used a large washer first, to produce a deliberately over-sized plate, to be sawn out using a hand-held saber-saw, or “jig-saw” as some call it. 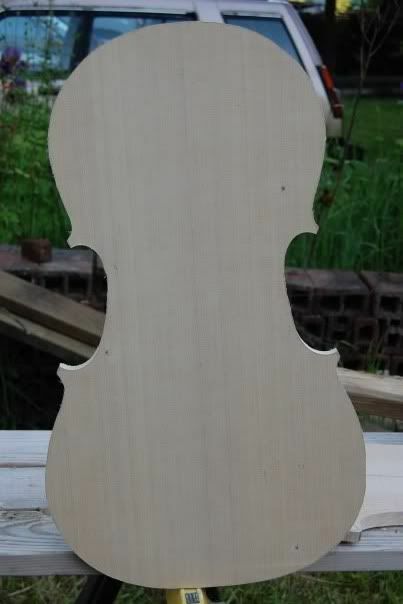 the only reason I did this is that the cello plates were too big to comfortably cut out on the bandsaw. I used the large washer and pen to make a cut-line well outside the finished margin, so that I could cut it out with a saber-saw, and get the plate small enough to handle on my bandsaw. The maple is so tough the saw tended to overheat; I had to stop and let it cool. 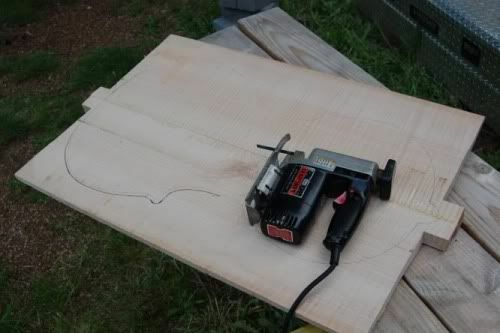 The maple was hard to cut with the small saw– I had to stop every so often, and let the motor and blade cool. Notice that I was cutting well outside even the oversized margin– I could not afford any mistakes at this point. The final perimeter, including the corners is carefully drawn in, to exactly the shape desired. This is the spruce front plate cut exactly to final shape, but at full thickness. Here are both plates, ready for preliminary arching…and purfling. The black lines are just dirt– it went away when I began arching the plates…which is the next step, by the way. 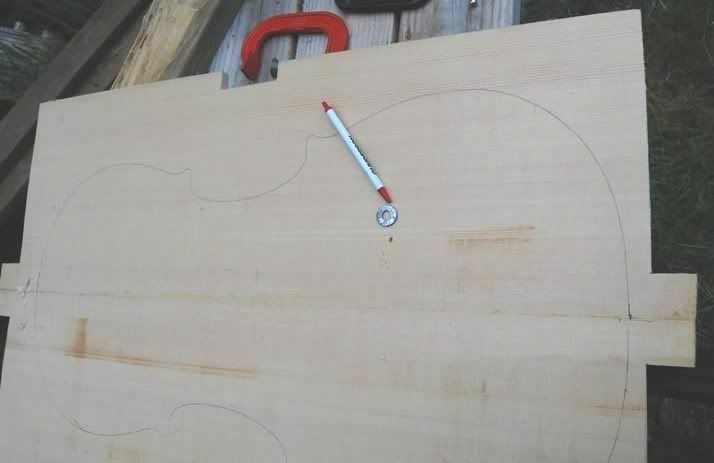 am ready to make a home made flat-plate (slightly arched top and back) cello like I make guitars – BUT – have questions about the neck angle and tuning pegs. Well…I don’t know what to tell you– I have never seen such an instrument. 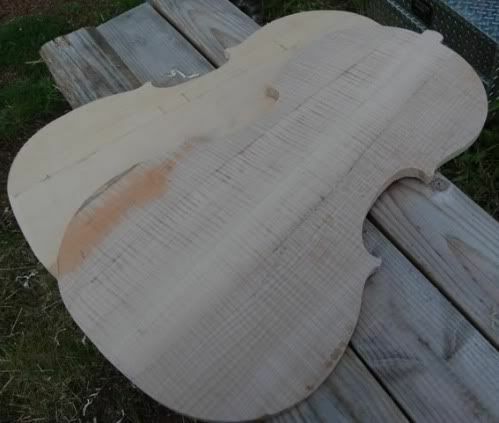 If you have the Henry Strobel books “Violin Making, Step-By-Step, and Cello-Making Step-By-Step, I think you will find the information you want…but right now I don’t know what you are asking. Do you want the angle that the strings make, going over the bridge? Just the angle that the neck makes at the heel? 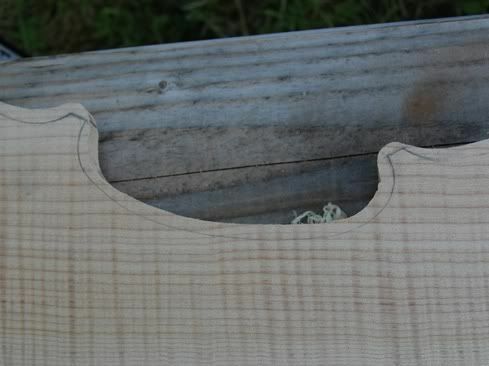 the angle at which the neck-mortise is cut into the neck block? And…what is the question on the tuning pegs? Send me an e-mail (see the contact page) and I will try to help.